There was a time where the moment I got off an airplane and smelled that familiar coffee smell trailing it's way towards my gate that my heart would leap and I'd be exclaiming to Joe, "There's a Starbucks!" Living in the third world did that to me. There were no fancy cafés and there were certainly no lattes. Nescafe (instant coffee) ruled the roost. A couple of restaurants housed coffee machines and cafe au lait was possible although made with damn UHT milk and nothing came close to my beloved vanilla latte or chai latte or caramel macchiato. Product aside, there also were no coffeehouses that felt cozy inside and played coffeehouse music. There was no where to bring your computer to type to the sound of coffee bean grinding and frappuccino blending and there certainly wasn't a neighbourhood café where you'd regularly meet your friends to catch up. We did that in our homes because that was our only option. Funny enough, when we moved to Stavanger, one of the things I was most excited about was jumping back into café culture. The thought of creamy, foamy lattes made me salivate and I was so excited at the prospect that I'd have years to start uncovering all of the little cafés in this city. And uncover I have - over the last year and a half, a certain friend and I meet almost weekly to catch up on life. Sometimes we visit old favourites and sometimes we visit other places we've walked by and wondered about. Starbucks has never been present in Stavanger. In fact, up until recently, there was only one in the entire country and it was housed in Oslo's airport. When we first moved to Europe, I'd get my fix when we traveled. I liked the familiarity of it - I knew what and how to order and it was exciting when that first sip hit my tastebuds after months of being separated. Joe didn't get it (he's not a coffee drinker) but he'd support my semi-frequent stops in foreign cities. And then something happened... On one of our weekend trips, I passed by a Starbucks, smelled that familiar smell, and wondered to myself, 'When is the last time I went in?' We had been on a million different trips and passed by a million different Starbucks but I wasn't feeling that pull anymore. I certainly hadn't given up coffee but unbeknownst to me, I had given up Starbucks. 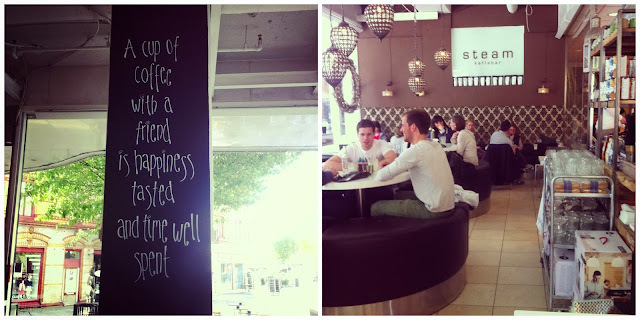 These days, I find myself looking for that independent café on a quiet street. 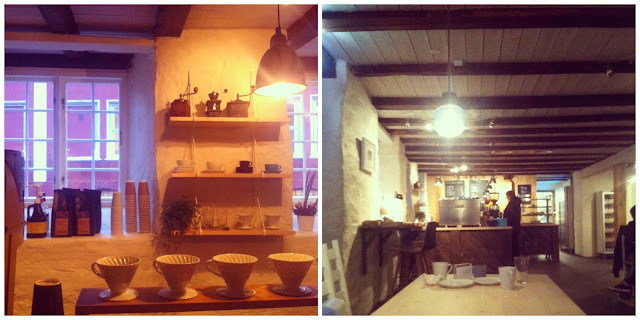 The ones that are small and quaint and serve good coffee. I love the idea of coming in from the cold, getting comfortable, sipping my kaffe latte, people watching and catching up with a good friend that doesn't include take out cups and definitely not drive-through. Perhaps it's just accommodating to my particular circumstances or maybe it's a sign that after 3.5 years abroad, I need a little less of the familiar and am more comfortable seeking out the other. This morning, I woke up and read an article that outlined Starbucks entrance into Stavanger and I'll admit, my heart sank a little. It detailed the space the company had purchased and that construction had already started in hopes of opening up the chain by the summer 2014. It's location on the harbour would be perfect for all of those cruise ship tourists who disembark, do a walk around the centre before returning to the boat - now maybe they'd stop by Starbucks and pick up their favourite drink before leaving. I get it and yes, it'll be successful but a part of me wishes it wouldn't be. To me, Norway isn't Starbucks, it's the quaint, cozy and locally run cafés and bakeries and I will be mightily disappointed if my favourite haunts can't keep up with the new competition. 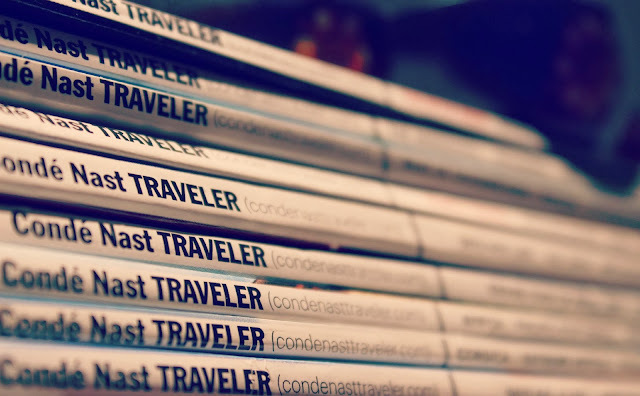 Last year, as part of Joe's birthday present, I purchased a subscription to Condé Nast Traveler. Every month both of us would look forward to a new magazine showing up in the postbox and it was great inspiration as we planned our travel throughout the year. At the end of the summer, I started receiving renewal notices and after humming and hawing over it, I decided to give other magazines a try, not because we didn't enjoy CNT, but just to see what else was out there. So I purchased AFAR for Joe and National Geographic Traveler for myself hoping we'd get our first edition somewhere around the holidays. Well, apparently they were well ahead of their 8-12 week estimate for the first delivery and now we find ourselves getting all 3 magazines each month. It's a bit of travel overload on our coffee table right now. Condé Nast Traveler is the mecca of wanderlust. Every year it curates a Gold List - that is, the most fabulous hotels in all the lands. This is both a blessing and a curse for someone like me who really, really loves nice hotels. The properties they feature are the crème de la crème, many of which are out of reach for the average traveler. But, it's nice to dream. Each edition features several locations and I find the articles to be interesting and well written. Joe and I also really enjoy the Where Are You? feature which is a sort of puzzle where you must find out the location with the photo and clues given. When you figure it out, you can enter to win a trip... and it's a really nice trip because it's Condé Nast. AFAR is like the coffee table book of the three. Visually, it's beautiful. The layouts, the photos, and the collections it puts together read like a work of art. There are always a few substantial (in terms of length) articles but there are quite a few one-page curations which are great for those who prefer to take their magazines in small portions. There's a great mix of different travel styles and if there was such a thing as a 'hipster' magazine, this might be it. It just feels cool. 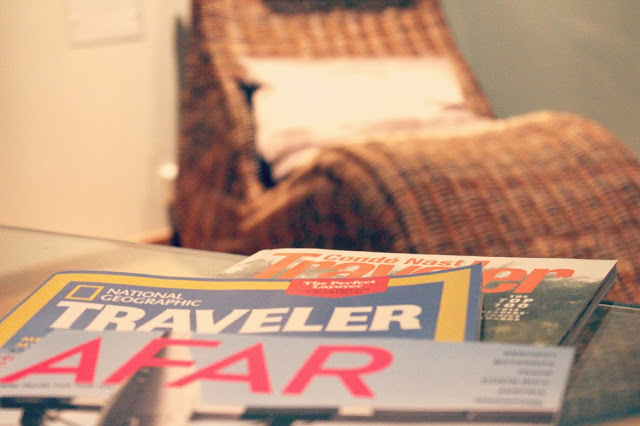 While the former might be hip, National Geographic Traveler is your classic travel magazine. You get everything you would expect in a travel magazine; beautiful photographs, interesting destinations, and great stories. The Nat Geo Traveler excels at tips whether it be where to get a great meal in a particular city to how to get a great sleep in an airport. This magazine feels a little more straight to the point - less babble, more practical. You know with each issue what you're going to get and the average traveler will feel like all of the features are within reach. 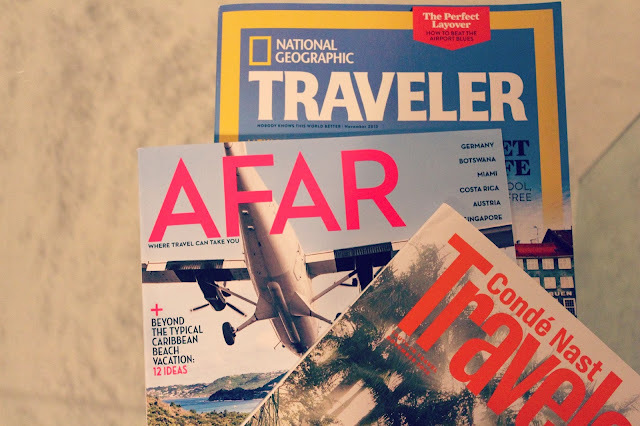 We've been holding on to every issue, stacking them up and going back to reference articles as we're travel planning and they certainly help to put some destinations on our radar. What do you think, which one suits you? It's been months since our trip to Istanbul and since I wrote my first post, post-trip. It was one of those trips that has been swirling around in my head ever since we returned and while I've been meaning to blog about it, I also wasn't ready to share it. When an experience was really good, it can be hard to put pen to paper (or fingers to keys) and sometimes, it's just nice to let it settle and be what it is without the pressure to articulate it. All that to say, I think it's time. My research told me that the majority of the main tourist sites were found in Fatih, also known as Old Town, in the European part of the city. It also told me that traffic in this booming city can be horrendous which led me to believe that it might be easiest to stay in Old Town. Generally, I don't like to stay in the tourist centres - while the sites are fantastic, it's nice to be able to escape the crowds and the restaurants geared towards foreigners at the end of the day. So, I compromised and booked the first few nights in Sultanhamet before we'd cross the Galata Bridge to Beyoglu for our final couple of nights. Our first hotel was Hotel Sultania located on a pedestrian street lined with restaurants and hotels, mere minutes from Topkapi Palace, Hagia Sofia and The Blue Mosque. 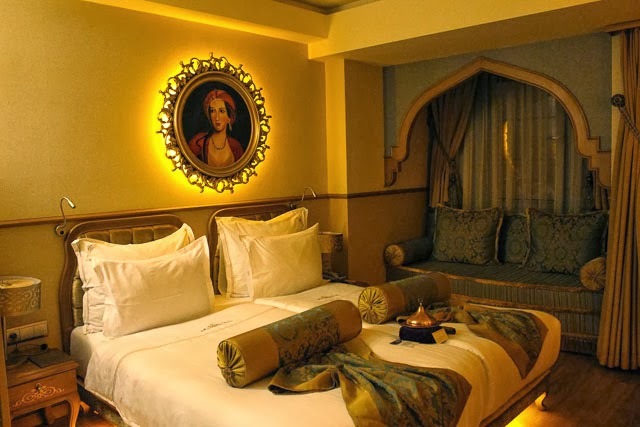 The hotel itself is relatively small with 42 rooms all named after famous Sultan's wives in the Ottoman Empire and it's decorated with traditional Ottoman style. Our room was spacious, comfortable and very clean and while the decor was a little kitschy, it seemed fitting for the area. The staff was also really friendly and intent on making sure we had a lovely stay. Our stay in Fatih was certainly convenient. We didn't need taxis or public transit as everything in the area was easily reachable on foot and it allowed us to hit the main sites within the first couple of days. Finding restaurants was a little more difficult as there were hundreds around but the kind with inflated prices and that don't feel particularly authentic. But, we enjoyed the convenience. After a couple of full days visiting the sites that make Istanbul a famous tourist destination, we were definitely ready to cross the Golden Horn to our second hotel, The House Hotel Galatasaray. As our taxi weaved up a tiny, one way road lined with junk shops, I did have a moment of panic wondering if perhaps I hadn't made the right choice but the feeling was quickly dispelled. In fact, booking this hotel might have been one of the best decisions I've ever made.. There are three House Hotels in Istanbul all designed by well-known Turkish designers, Autoban and all located in restored apartment buildings. (This company also claims the scrumptious and beautiful House Cafés found throughout the city.) 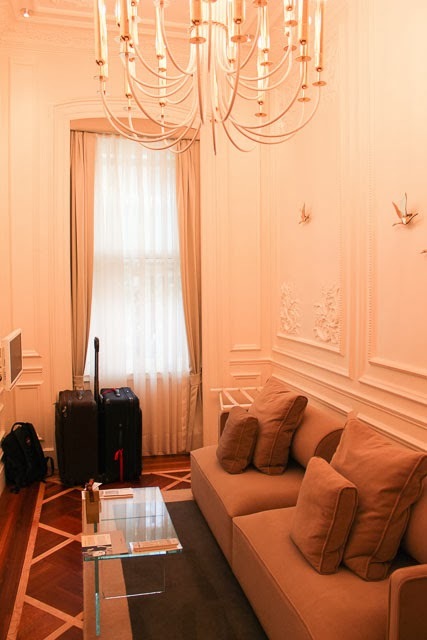 The Galatasaray was the first of the 3 hotels to open and is found just down the hill from Istikali Avenue, a popular, pedestrian shopping road leading up to Taksim Square, yet set amongst apartment buildings, galleries, and independent shops. Our room was stunning. In fact, upon pushing my bags to the side, I asked Joe if we could move in. 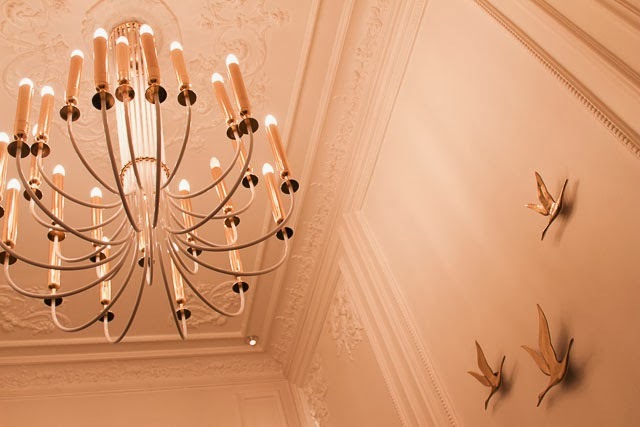 The attention to detail was evident and it felt welcoming and homey yet luxurious. The shower in the middle of the room was surprisingly quite functional and the lounge on the top floor was impeccable with fantastic views over the neighbourhood. We loved this hotel. In the end, both Hotel Sultania and The House Hotel Galatasaray were great choices. For a first visit to Istanbul, if you have the time, I highly recommend choosing to stay in a couple of different neighbourhoods and especially outside of Fatih for a more well-rounded view of the city. If we are lucky enough to return to Istanbul (and my goodness I hope we are,) we'll probably forgo Fatih and stick to Beyoglu... and probably the House Hotel Galatasaray. -Hotel Sultania often has different deals featured on their website. We were able to secure free transport from the airport. 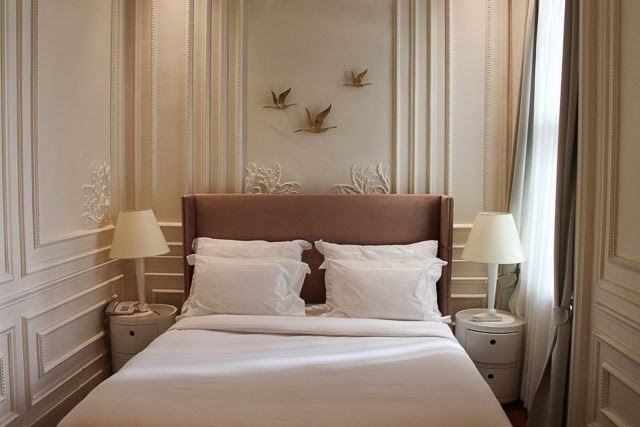 -We booked The House Hotel Galatasaray through Design Hotels for a better rate. Luck had it that our first expatriation landed us in Gabon, a French speaking country, and I had some French education behind me. Even so, when we arrived, it had been years since I'd spoken a word of French and several more years since I had to use much other than simple conjugation, ABC's, 123's and classroom vocabulary. For the first several months, I cowered behind my language skills scared to make mistakes, stumbling over words that had long buried themselves in the depths of my brain and fearful that if I did respond and pass off my French, I'd be rewarded with a flurry of words that I couldn't keep up with. Yet, when you move to a country where 99% of the population does not speak English, it becomes a sink or swim scenario. Eventually, things started to connect again in my mind and soon I was spending much less time pre-formulating sentences well ahead of any communication. I credit a lot of my confidence to speaking with our guards and our housekeeper - they were consistent relationships who were patient and understanding as I tried to piece together what I needed. They didn't correct me or walk away when I wasn't making sense; they worked with me until we were both in complete understanding. While this was happening, I could feel my grammar slipping away. No longer was I worried about saying something perfectly, I just wanted to be understood and generally, I was. I knew I was making a plethora of mistakes and I felt frustrated that while my oral communication had improved tenfold, I wasn't improving on the details of the language. With French teachers few and far between, I continued to bump along, conversing haphazardly yet fairly confidently. Of course, the move to Stavanger brought my French language use to a halt. I had aspirations of meeting a couple of French expat wives who I could meet for coffee once a week but it didn't happen. A year passed and aside from a couple of jaunts to French speaking countries, I did not utter a word of French. Some days, I'd translate my day in head to see if I could still do it or I'd turn the TV to France 24 but would quickly lose interest. Come June, I stumbled across a French language teacher in Stavanger and before I could talk myself out of it, I composed my best email in French detailing that I'd like lessons in the Fall. Since the end of August, I've met with a lovely French woman once per week for 1.5 hours at her home. During my first lesson we completed a placement test where my teacher remarked that my oral communication was strong but my written was lacking. I found this interesting as my entire French education, I felt the reverse, a fairly common notion for anyone who has learned a language in a classroom with more pen to paper than anything else. From "Bonjour" to "À la semaine prochaine" we do not speak a word of English. It is exhausting. One on one, we work through grammar and vocabulary; we'll do fun things like make crêpes and play games or we'll watch adverts on youtube. Sometimes the words flow easily and the lessons are quickly grasped whereas others are more of a struggle as I try to wrap my head around le girondif and curse the masculine/feminine forms. I've come home laughing that my teacher had reprimanded me for not answering in full sentences which unexpectedly sounded as if I'd been listening to myself several years prior with my FSL students in Canada. The tables had turned and now I found myself une étudiante once more. It's been good. It's been good to flex my brain a little more. It's been good to polish up my language skills and it's been good to feel the slightest bit more productive.